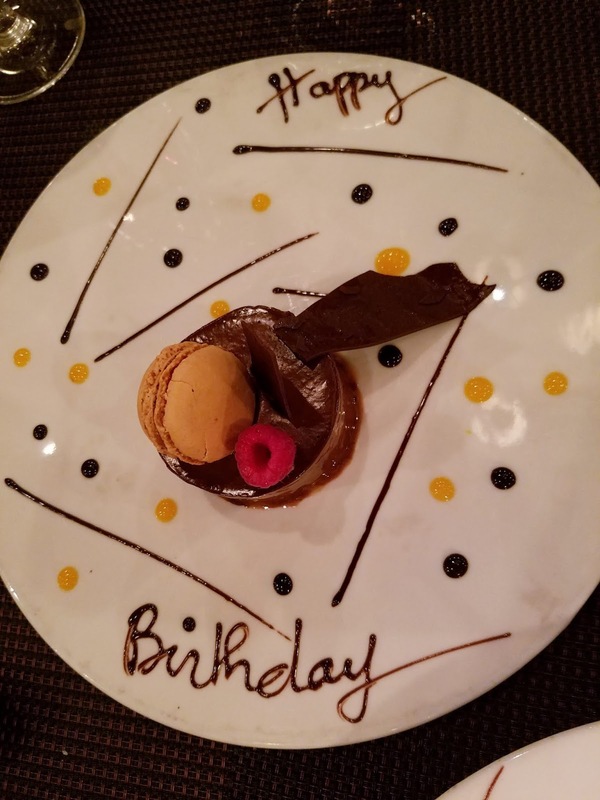 My favorite way to spend my birthday is sharing great food with friends, and as an added gift, we dined at my friends’ restaurant, A Food Affair. Babette and Christian welcome everyone as friends whether it is your first visit or fiftieth, so my friends who had never been felt as welcome as my friends who revisited. 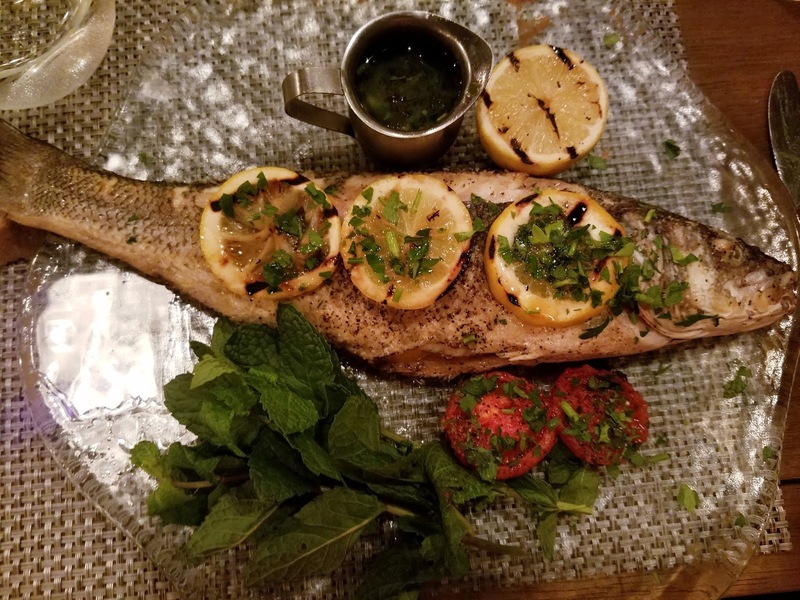 The whole branzino with grilled lemons served with a side a sauce of mint and parsley was perfectly cooked and I completely forgot to add the side sauce because the clean fresh flavor of the fish was so delightful. 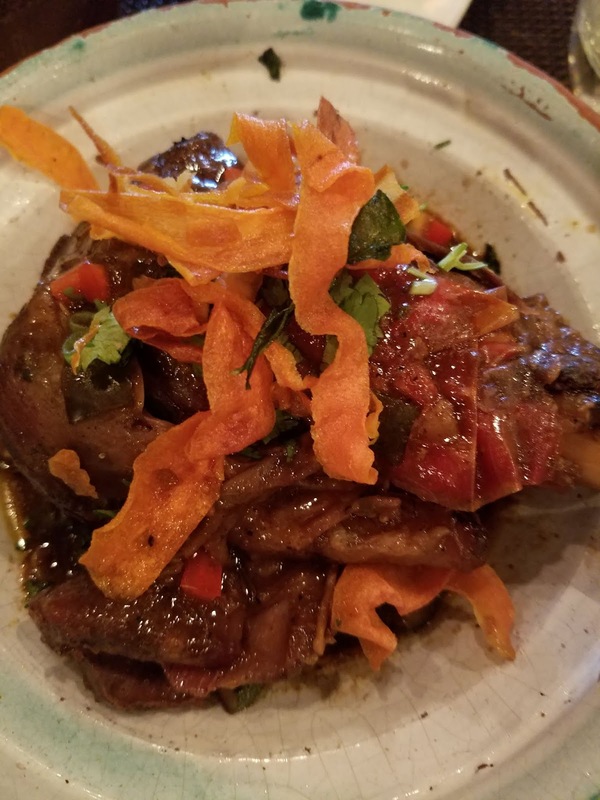 The lamb shank tagine was a special that was actually delivered in a tajine! 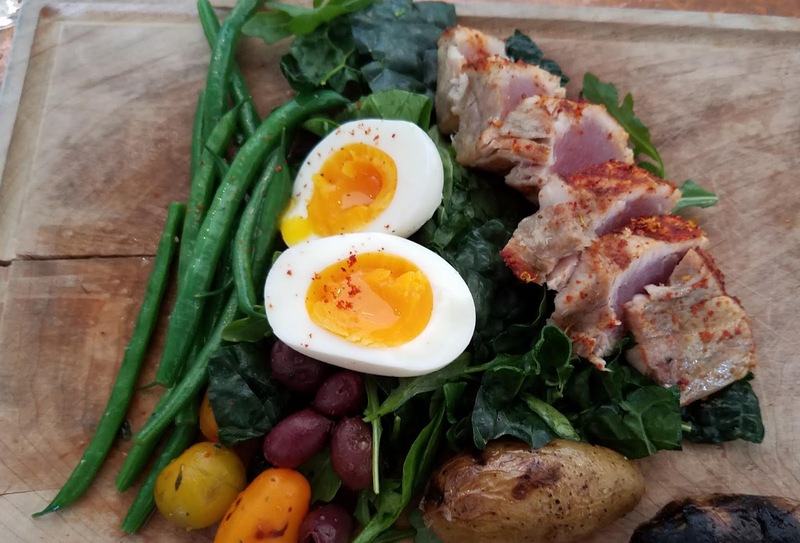 The meat was falling off the bone tender, redolent with Moroccan spices, and the portion was enough for two meals (I devoured the leftovers the next day). 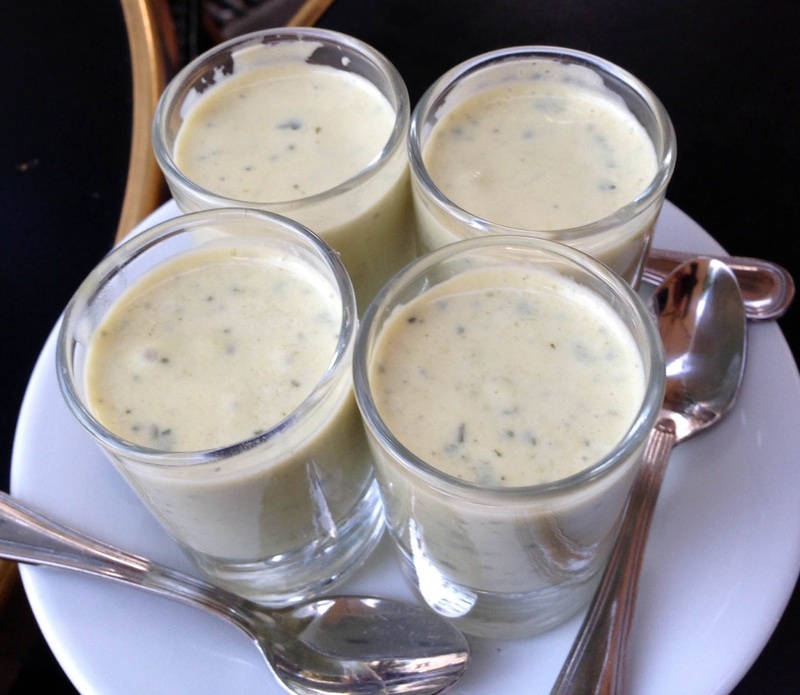 You may not see the escargot because they are smothered in a smooth garlic, parsley and cream sauce over potato, but they are like hidden gems that burst with flavor. 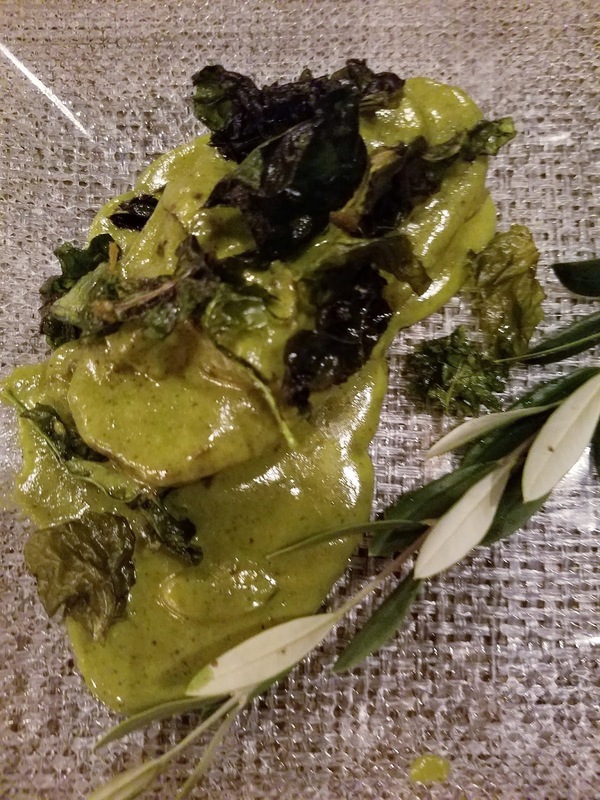 If you have never had escargot, this is a perfect introduction, and if you are an escargot fan, you will be enthralled by this version. 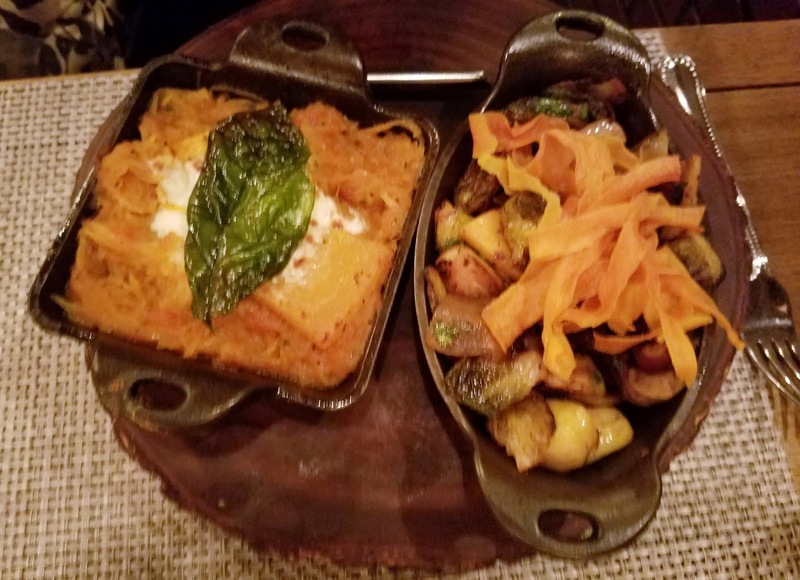 For vegetarians, the hearty Farmer’s Market Casserole with eggplant, brussel sprouts, mushrooms and a spaghetti squash and tomato terrine could be a main dish, or large a vegetable side dish. We chose a nice Bordeaux to accompany our meal. 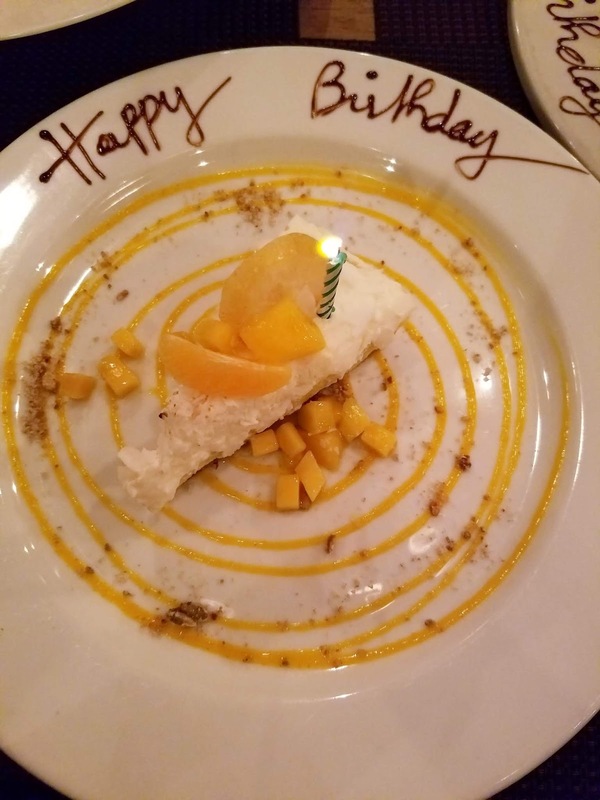 And even though we only ordered one dessert, the marvelous Royères sent out practically every dessert on their menu with candles and birthday wishes! 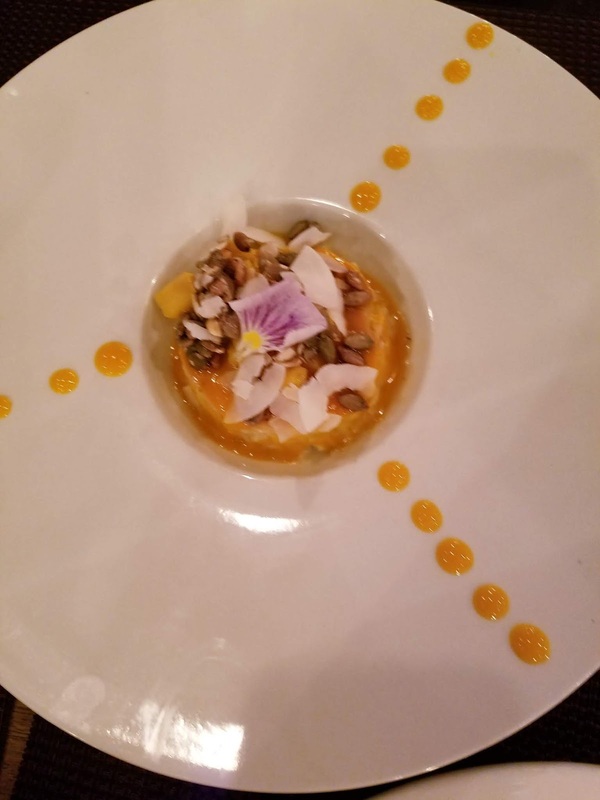 The coconut crème caramel was my favorite, filled with lots of coconut, passionfruit coulis, and sprinkled with pepitas, the textures and flavors all complimented each other. 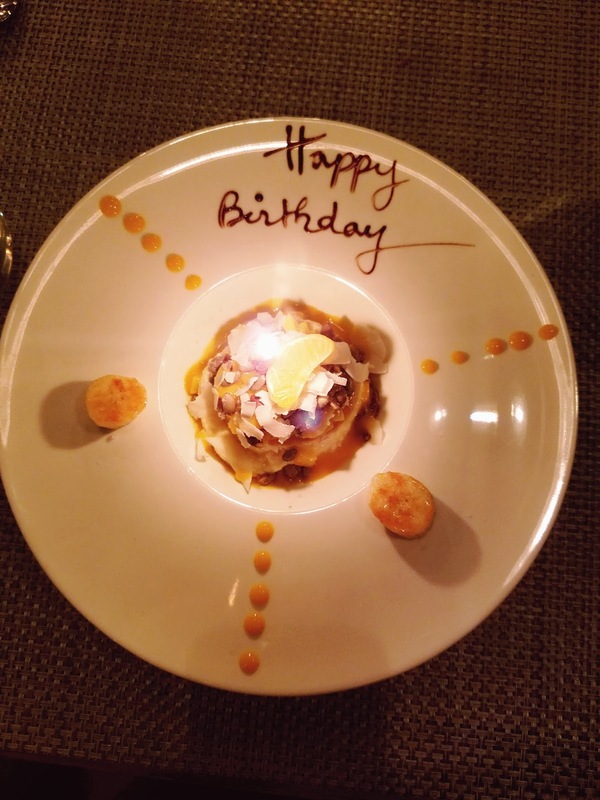 My birthday wish is a secret, but it’s no secret that I love A Food Affair! 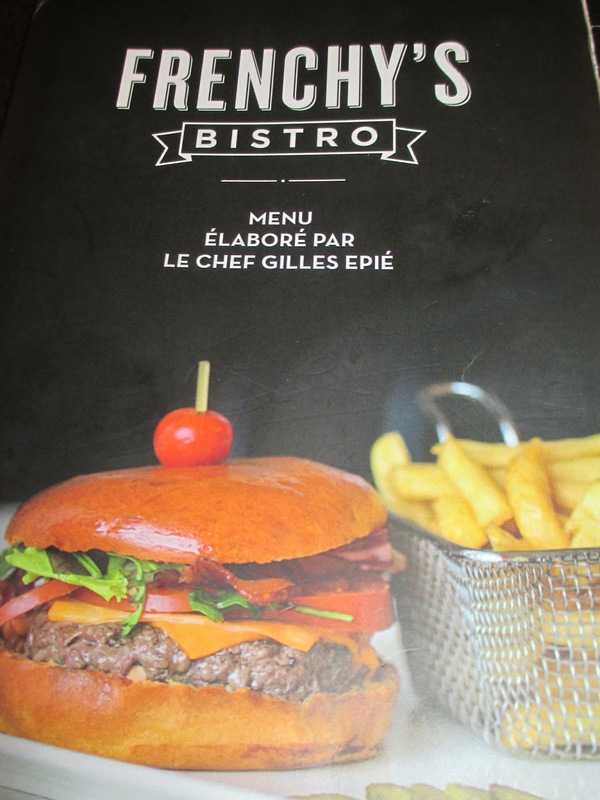 There are many options for a meal at CDG, but when one of them is Frenchy’s Bistro, it’s an easy decision. Gilles Epié was given a Michelin star when he was only 22, and was the chef at the famous l’Orangerie in Los Angeles. It was a fitting place to eat before my flight at a restaurant run by a chef with a long history tied to Los Angeles. As you can see from the menu, prices are very reasonable for a quality meal inside an airport. Set menus promise that you will be served within 30 minutes so you can be sure to make your flight at the gate just a few steps away. 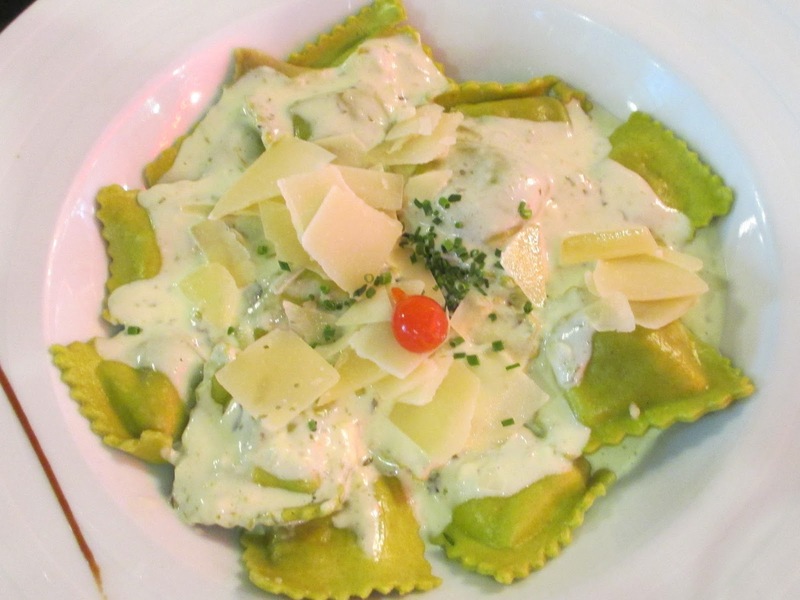 My friend ordered the pasta special which was a filling dish with the cream sauce and cheese. It was not particularly noteworthy, but a good option for vegetarians. I chose the classic Steak Frites with salad and a glass of wine, all for under $25 USD. 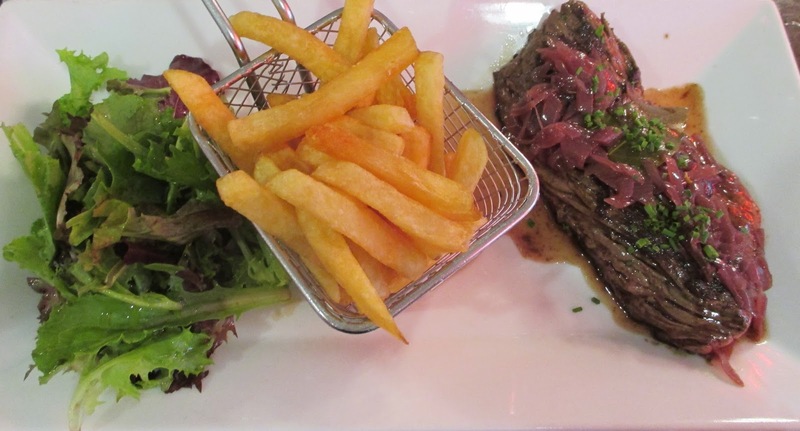 The steak was tender and cooked rare as I requested, served with a light red wine sauce, the fries were crisp and hot, and a small green salad with a vinaigrette on the side made for a classic French bistro lunch. 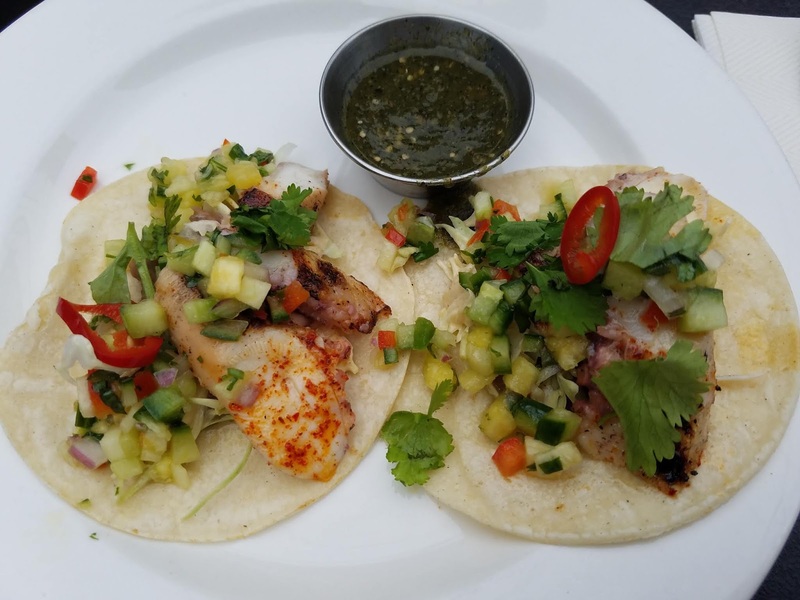 Finding a favorite restaurant is always a pleasure; the joys of great atmosphere, professional service, and delectable food, combined in one place is as rare as winning the lottery. 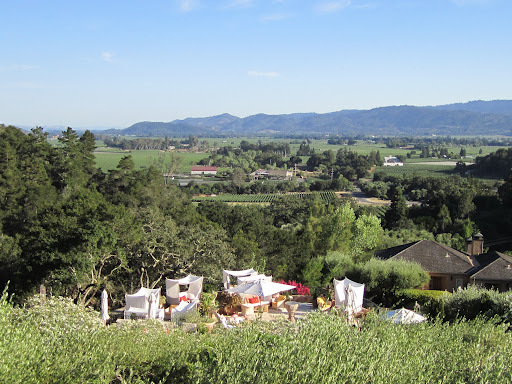 La Cantine de Marius is a winning jackpot, with a view of the Chateau from the terrace, efficient, knowledgeable service, and a chef who uses an array of fresh products in beautiful presentations. They could easily charge twice as much for their menu, but in keeping with what makes them remarkable, they keep their prices affordable enough so that you can go frequently enough to know everyone by name; on several occasions the clients had inside jokes with the servers, bantering as friends, breaking the invisible French wall of reserve between client and establishment. 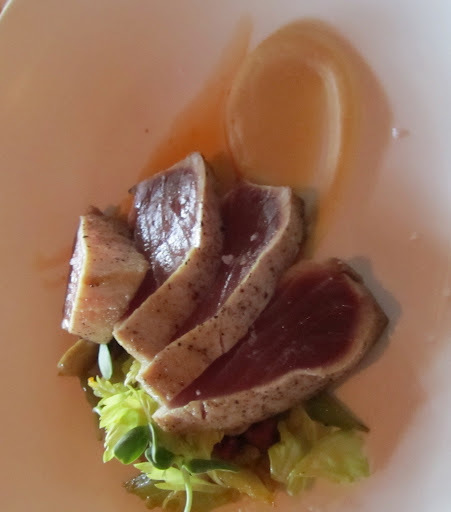 Lunch menus range from 16,50 Euros to 21 Euros ($18-$23 USD), depending on whether you have 2 or 3 courses. 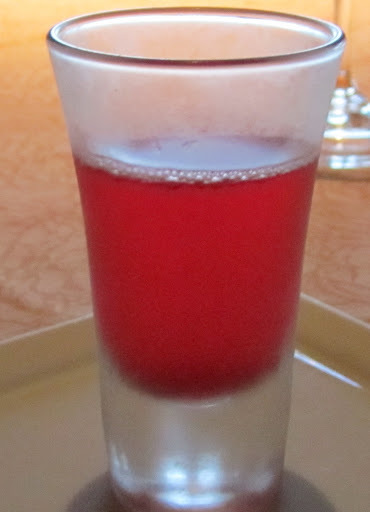 Wine is a modest 5 Euros ($6 USD) per glass and delicious whether you choose a white or red. The interior is as comfortable as the terrace, even more so on hot muggy days or cold chilly nights. 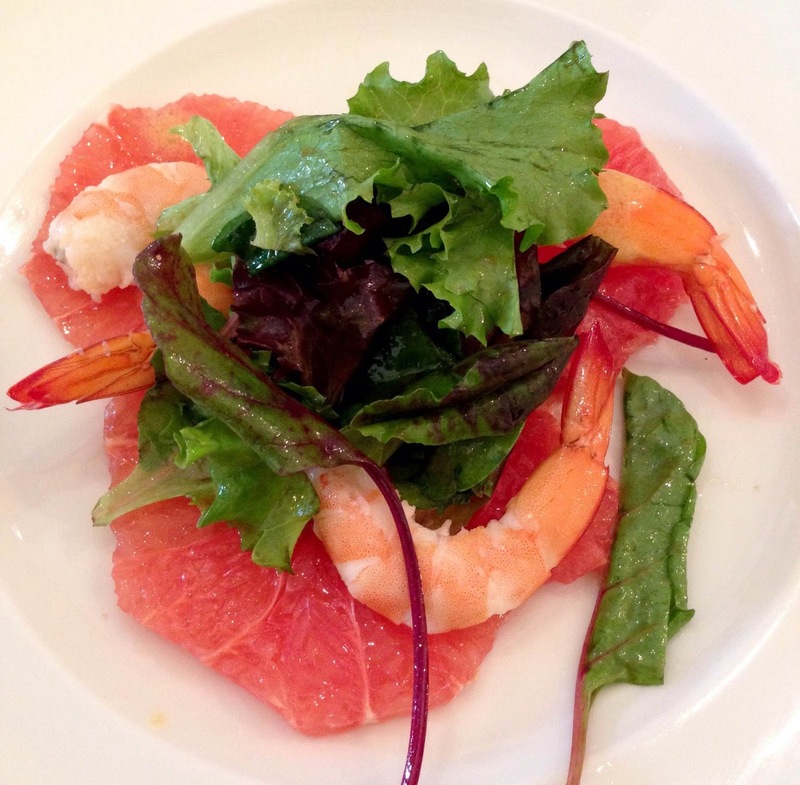 The first course on the lunch menu was a light salad of shrimp and grapefruit in a citrus vinaigrette that was as refreshing to eat at it was to look at on my plate. 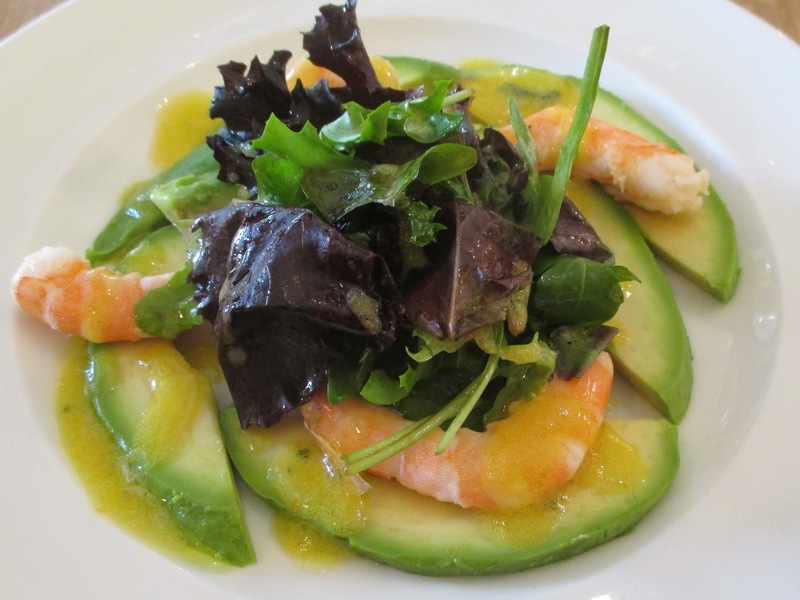 Another appetizer was a variation on the same theme, with avocado replacing the grapefruit. 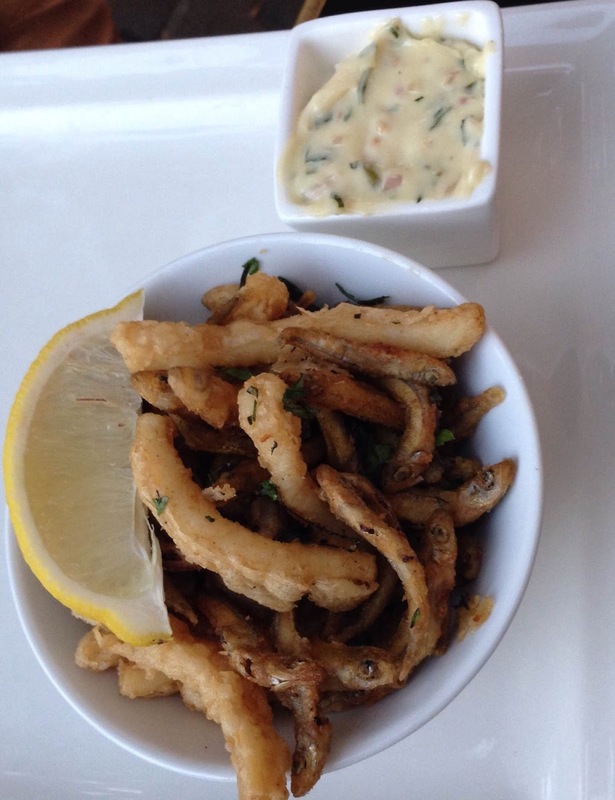 The fried smelt and calamari appetizer was plenty to share or even make as a course if you are not too hungry. 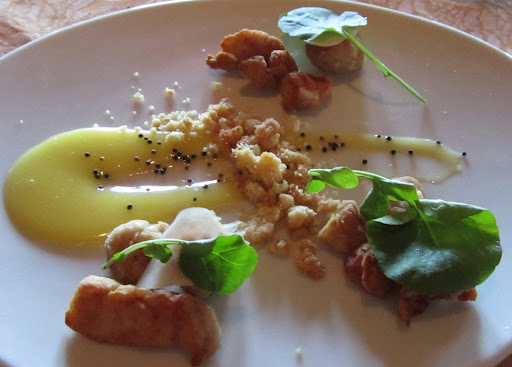 The homemade tarragon mayonnaise was a nice side, even though the appetizer was good with just lemon and salt. 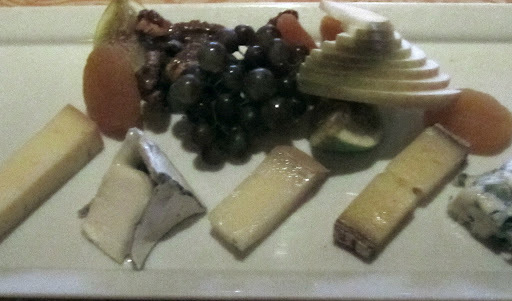 At only 8 Euros ($9 USD), it was a bargain for the skilled light touch of the chef and the generous quantity. 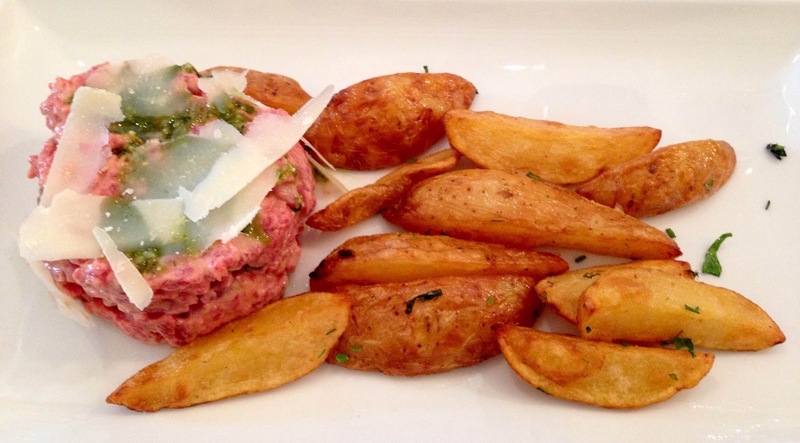 They do slight variations on classics, like this beef tartare with a basil pesto. One night the special was filet of bar with a side of confit leeks for under 20 Euros ($22 USD) that was as expertly cooked and seasoned as a plate twice the price elsewhere. 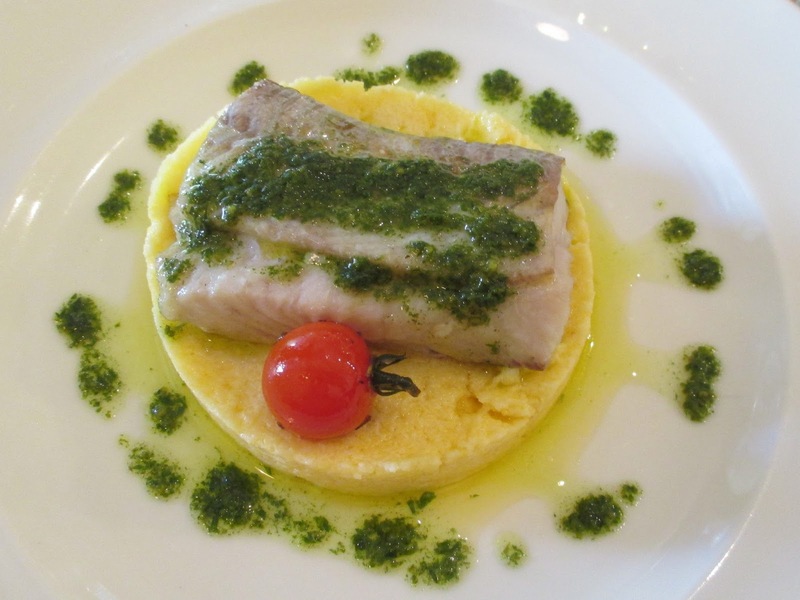 Lunch menu portions are a bit smaller, but equally satisfying, with fish like Merlu on a bed of polenta. 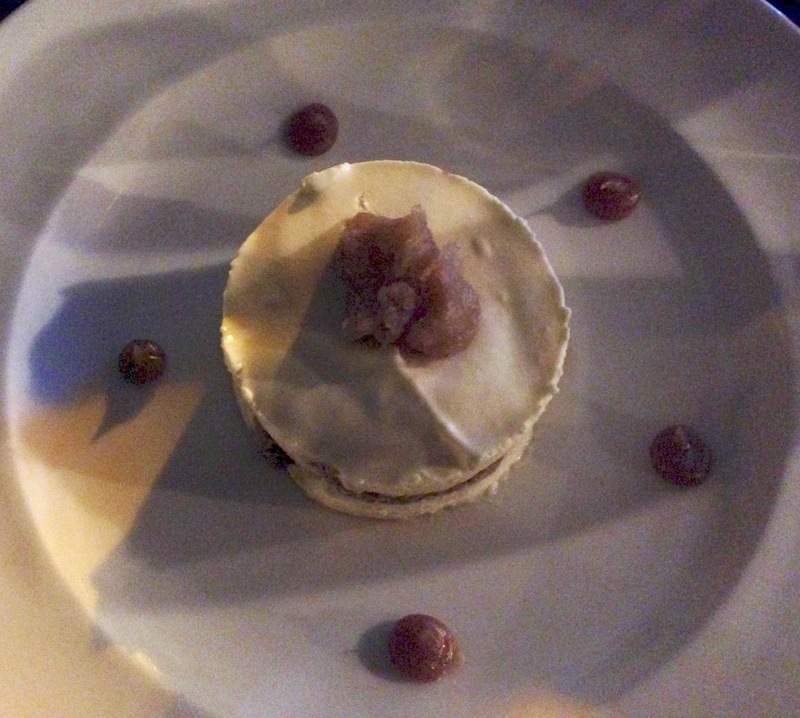 We ordered their meringue and fruit dessert along with the chocolate cake with pistachio ice cream for dessert (sorry the pictures did not come out), and they gave us this chestnut tiramisu for dessert, just because three people shouldn’t have to share 2 desserts! All were fine endings to our meal and range from 6-8 Euros each ($7-9 USD). The spots of blue and sun this winter have cheered me with hope of spring and summer, and I had visitors from L.A. who came bringing me even more hope of friends who will come. 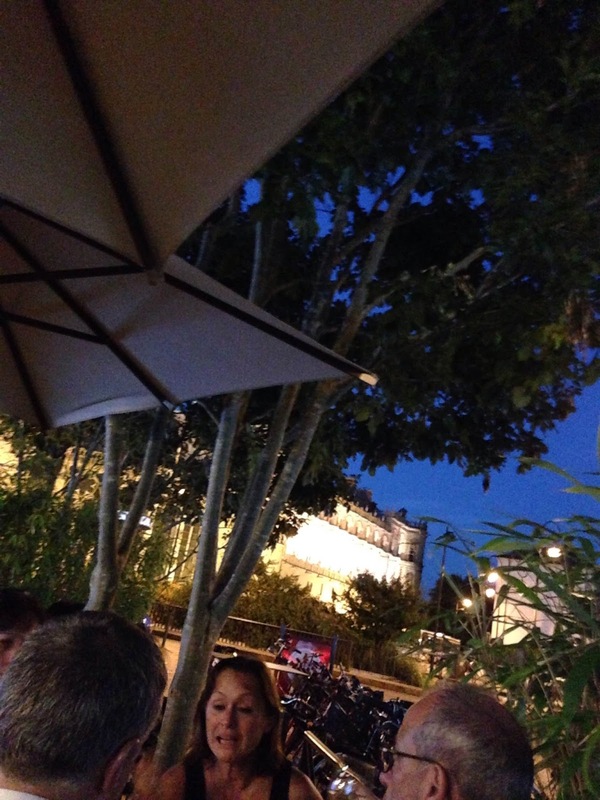 After they spent the day sightseeing without me, we met for dinner at La Table des Anges. It was a perfect place to bring Angelenos. 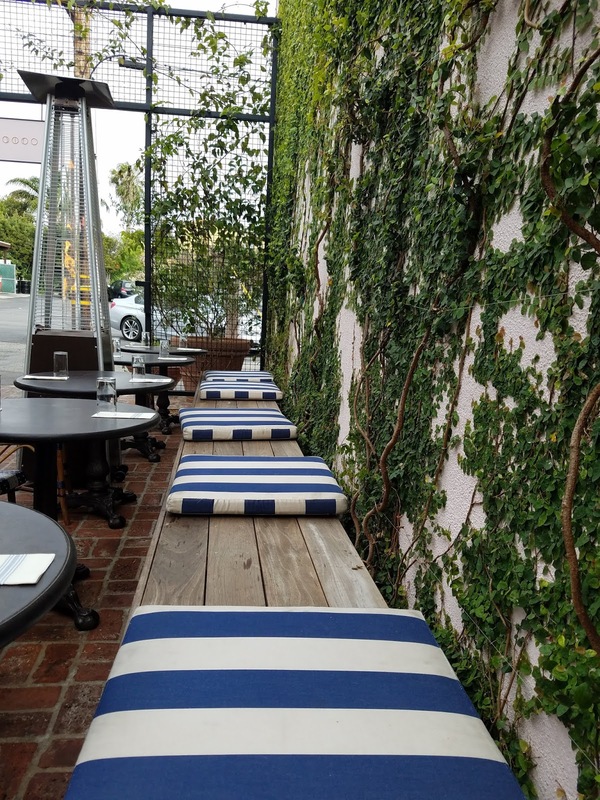 With a friendly casual vibe and fresh market ingredients, it was as if L.A. came to Paris and my friends liked it so much they wanted to bring it back to L.A.! The Pigalle area used to be the red light district until new chefs found the rents affordable and made this area the new food mecca. The charming welcome was enhanced by the fluent English speaking servers because neither of my visitors spoke French (we were the only people speaking English in the restaurant, so this was definitely not a tourist destination). With lunch menus for 2 courses at 16€ ($20) and three course dinners for 32€ ($40), this is a bargain for food by a chef who has worked in places where the menus run 3-4 times more. 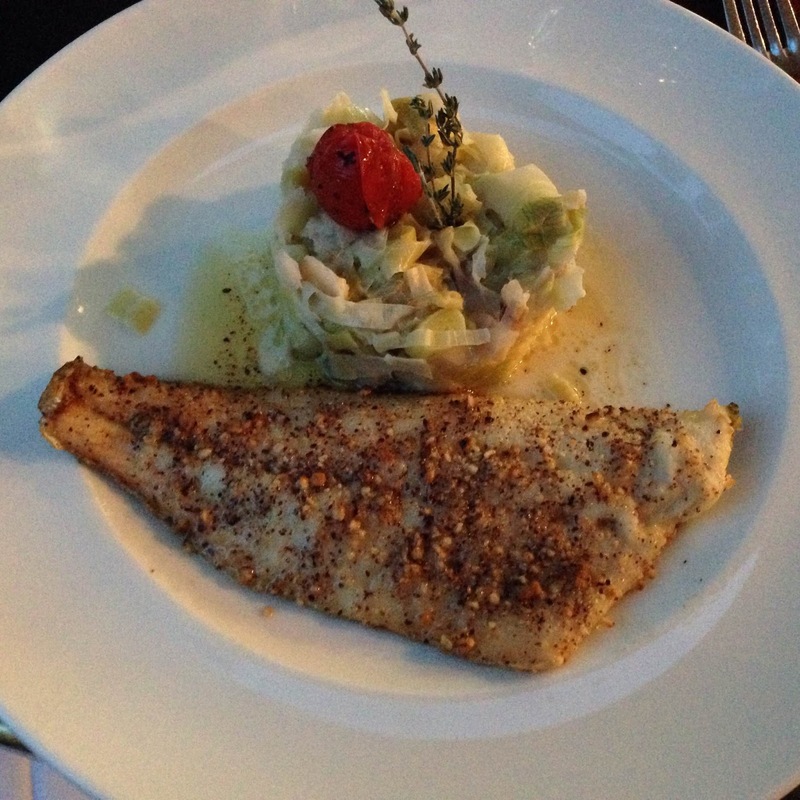 We ordered a bottle of Sancerre for 39€ ($55) which was a lovely compliment to our fish dishes. 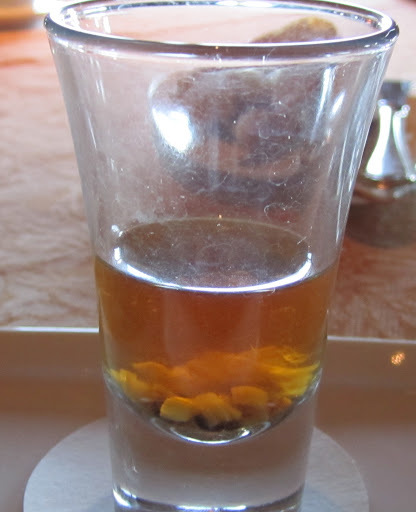 A savory amuse of consommé with fresh coriander was a warm and savory way to welcome us and awaken our palates. We looked at the menu with three courses, but none us us could imagine eating that much. When we saw what neighboring diners were ordering, we asked the waiter what the dishes were and decided to order the specials. The whole bar (bass) for 25€ ($30) looked so good I had to order it and loved the fresh fish atop luscious cepes mushrooms, roasted eggplant, carrots, and root vegetables. It was a hearty portion and I enjoyed every bite. 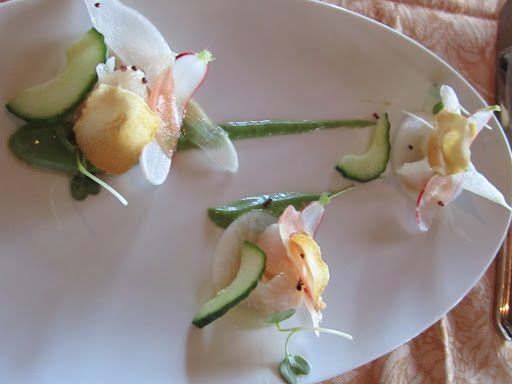 My friends ordered the skrei 23€ ($28), a kind of cod fish with the same vegetables as accompaniments, but a different sauce and they both ate every bite. If I had any room after my main course I would have ordered a dessert. Both my friends wanted dessert and ordered the pistachio crème brûlée. 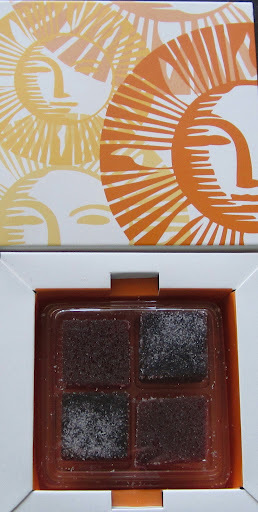 They insisted that I taste it and I was glad I did because it was much lighter than most and was not too sweet. Most Americans have at least heard of Bastille Day, July 14, which marked the beginning of the French revolution in 1789. 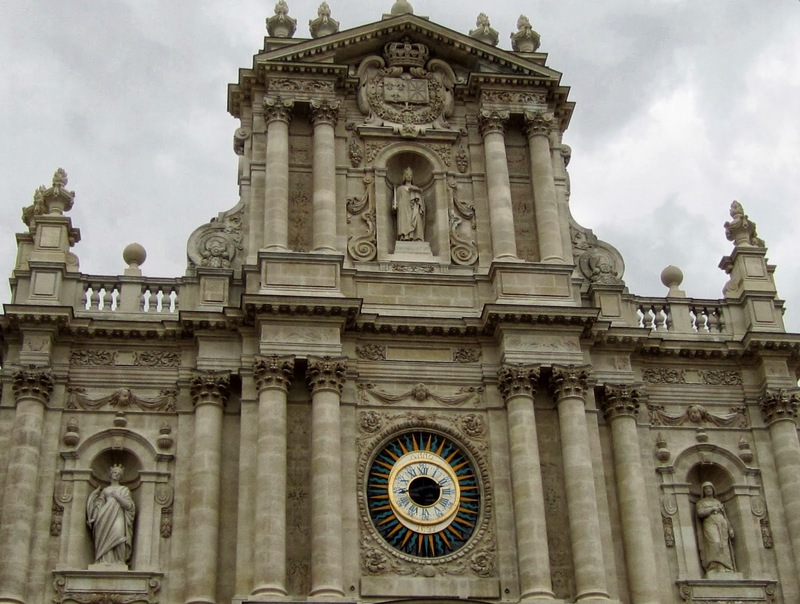 The Bastille was the infamous prison which was the prison that was symbolically linked to the end of the arbitrary rule of the monarchy and the beginning of democratic ideals. This monument stands where the prison was and is now the site of markets, demonstrations, a traffic hub, and numerous cafés. 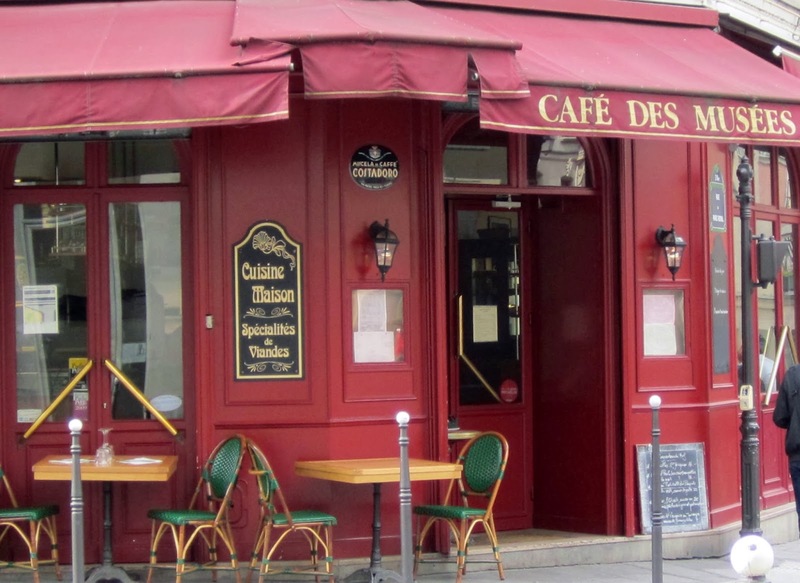 I headed over to Café Des Musées for lunch in the nearby Marais. Filled with a truly international crowd, including Japanese, Australian, and French tourists and locals. 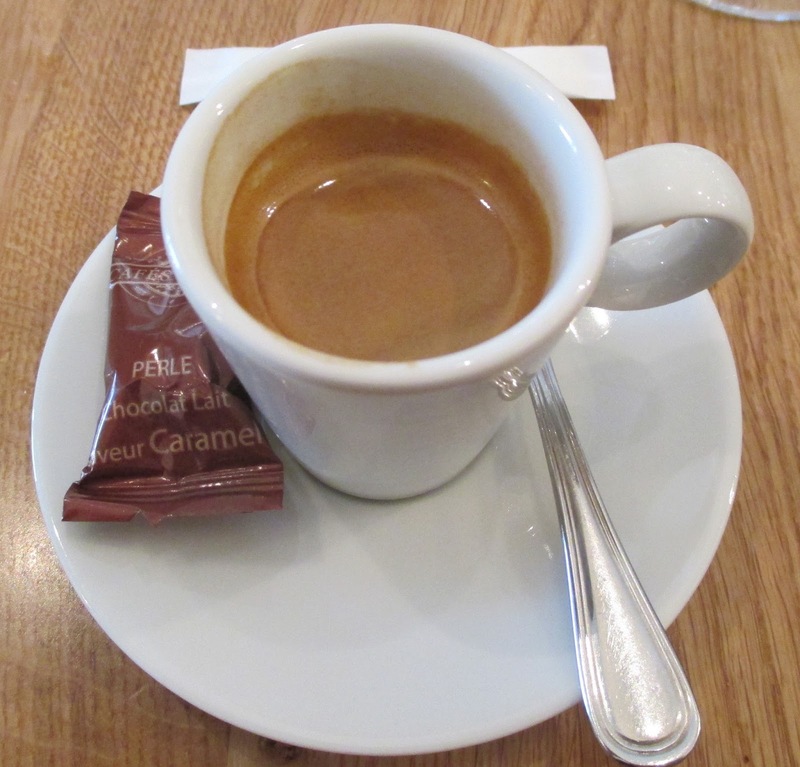 I loved that the waiter asked if I spoke French rather than assuming that I did not; I realized when some local Japanese came in that they were used to locals who may look like tourists and tourists who may look like locals, so they never made judgments. That attitude made me smile, as much as the fact that they opened a new bottle of wine for me once I asked for a glass of red, and actually gave me a taste to approve before serving me (of the house red whch was less than 5€ or $7)!There are five locations of this Café in the area, so if you’re in the 3rd or 4th arrondissement, this is a great place to come. 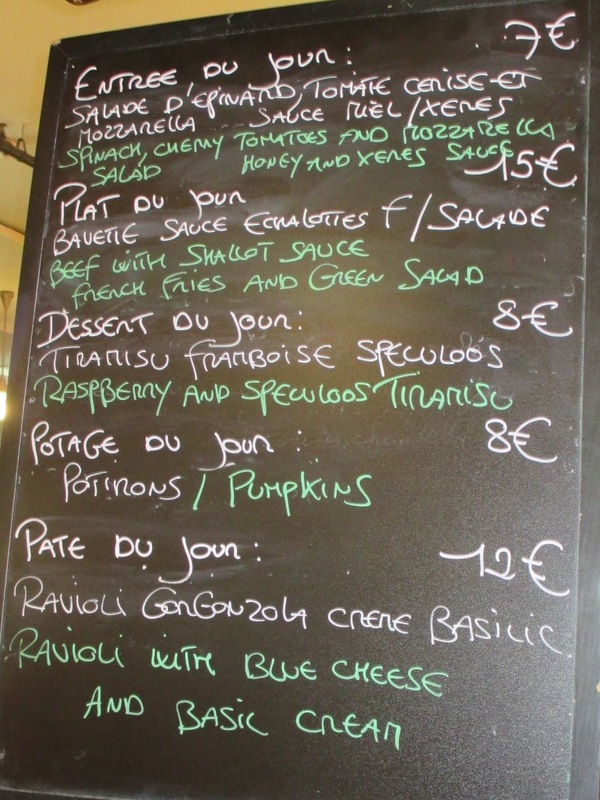 They have set menus from just 13€ (about $18USD). 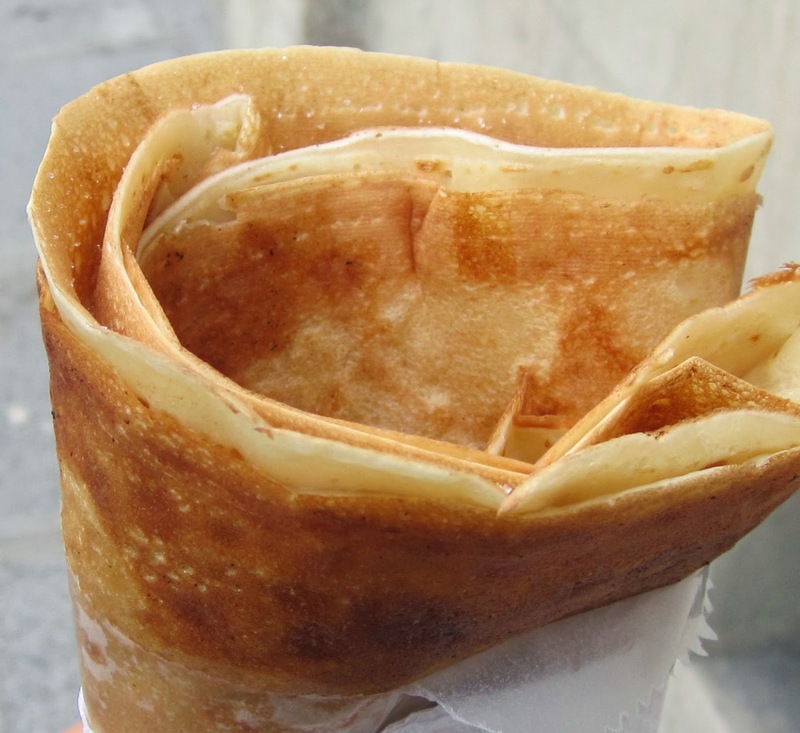 I wanted a crêpe to make up for the really bad ones I had on Île Saint-Louis, so I walked around and found a small stand called OH 58 where I got a wonderful crêpe a sucre (with sugar). It was tender, hot, perfectly sweet with a hint of butter and only 2€ (about $3USD). 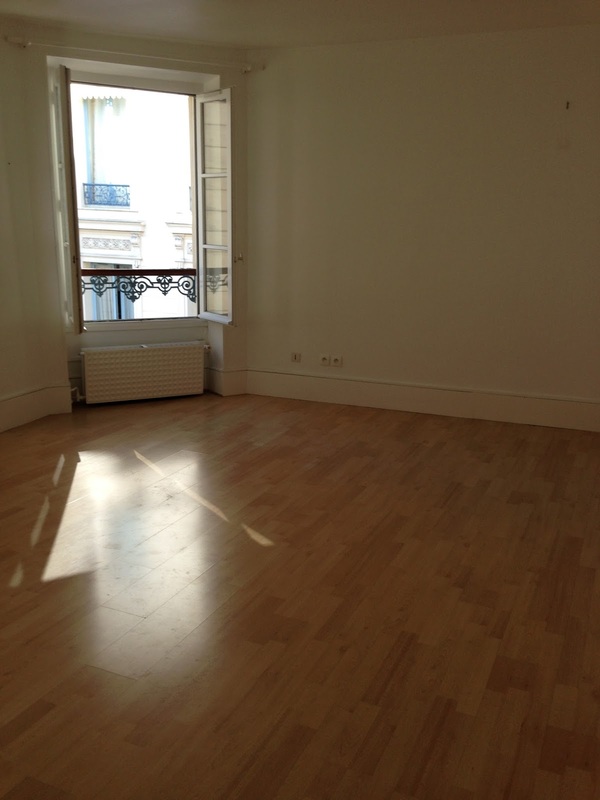 This stand is directly across the street from Monoprix, on Rue Saint Antoine, about two blocks from metro stop St. Paul. 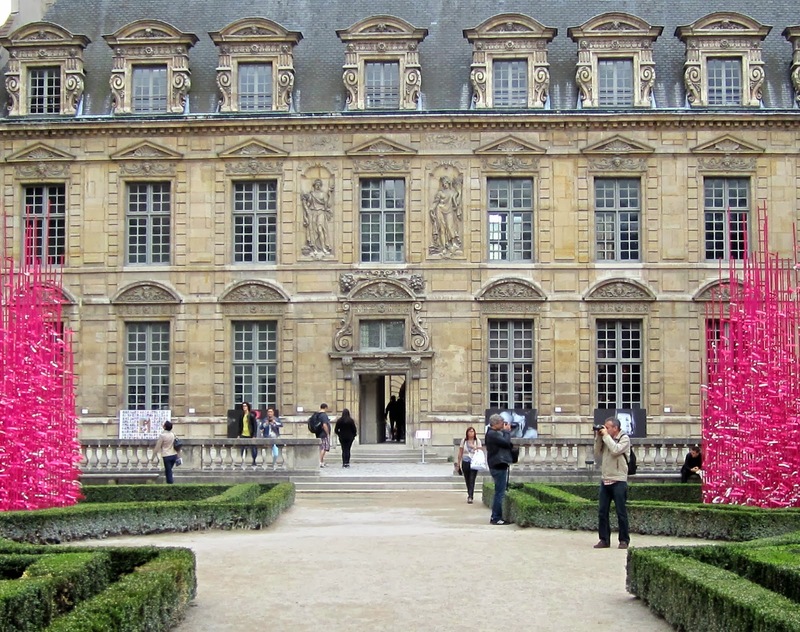 I wandered over to the Place des Vosges with its impressive arches, sheltering art galleries and restaurants overlooking the green square in the center. There was an exhibit off one of the arches to commemorate Breast cancer survivors; those are pink ribbons set onto two sculptures. 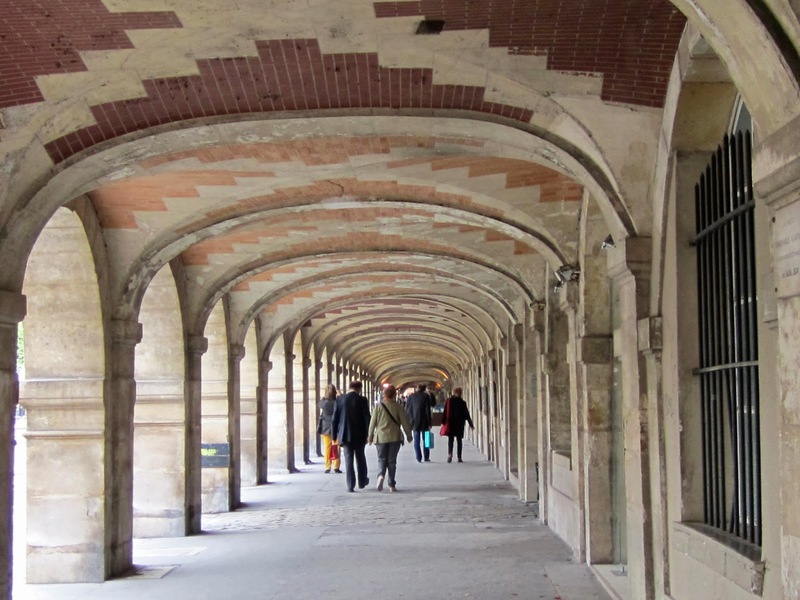 A bit of video inside the Place des Vosges looking back to the arches from inside the square. 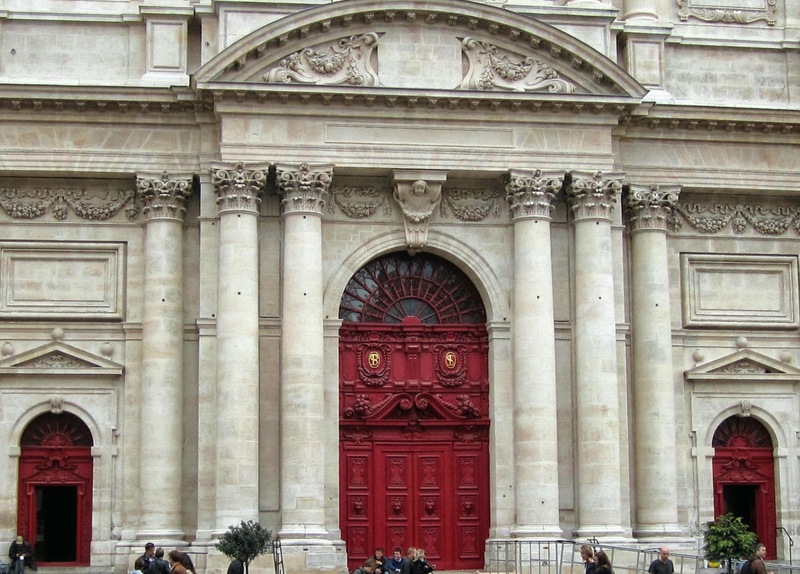 but the entrance had red doors! 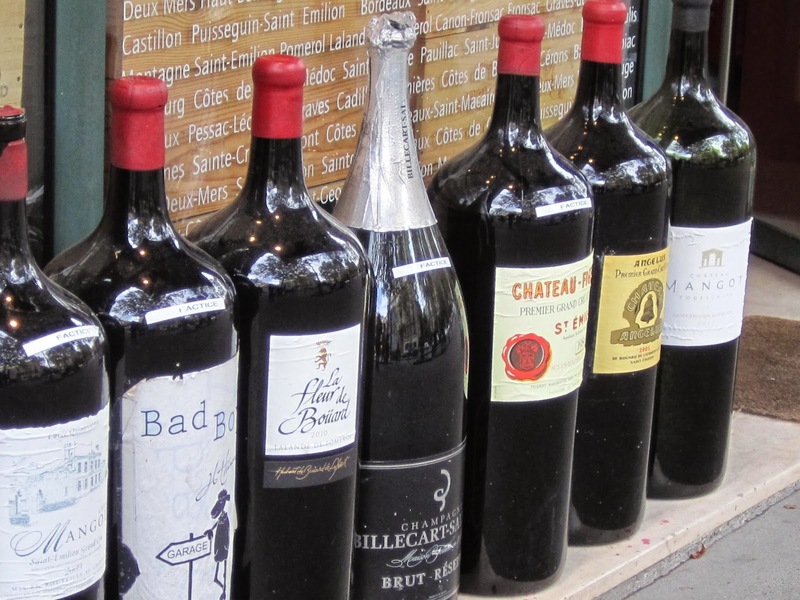 I saw a store specializing in Bordeaux with HUGE bottles called La Maison des Millesimes in the 6th arrondissement. Their prices were not great, but if you want something rare, this is the place to find that rare vintage or cru if you can’t find it anywhere else. 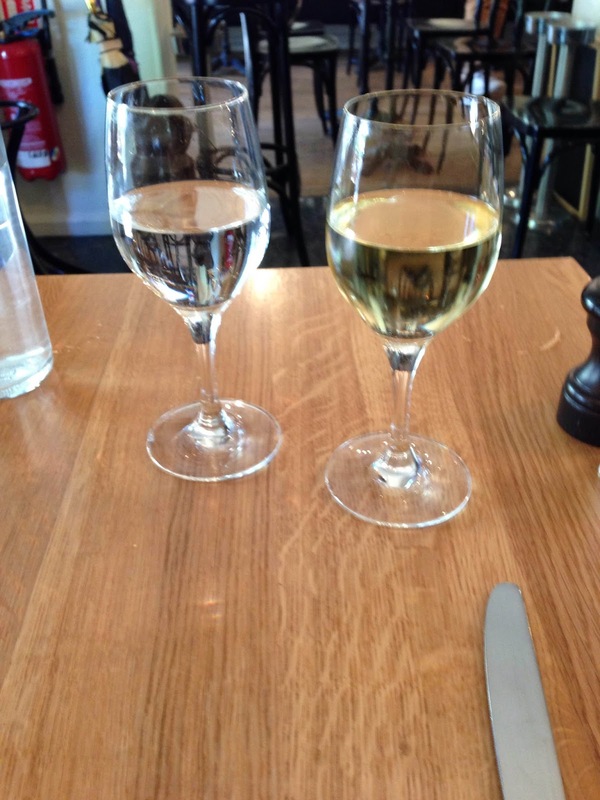 A day that started in the Bastille and ended with Bordeaux, what could be better? The best remedy for a sad love affair is a new one which is better. 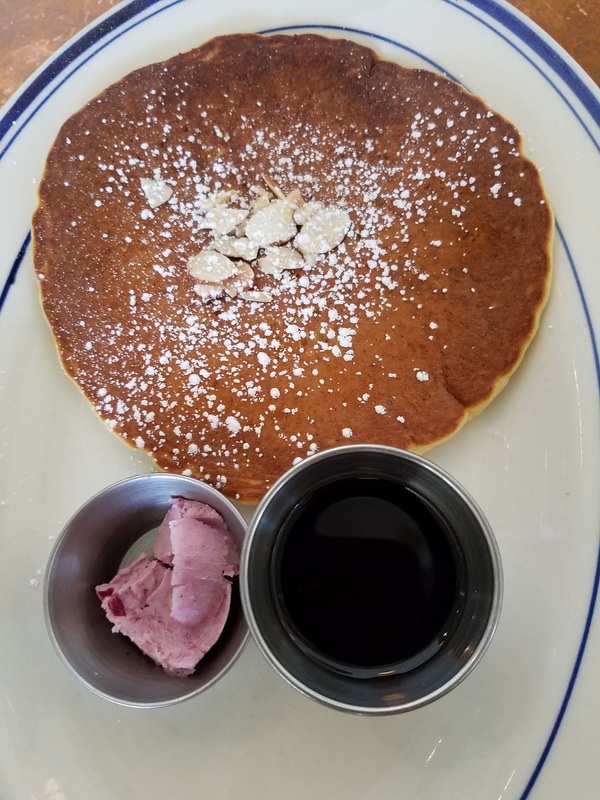 A Food Affair is the perfect antidote to my grief of bad owner attitude and a revolving chef in residence from my formerly favorite French bistro. I had to keep eating out until I found a better combination of food and service. Tonight I found the perfect neighborhood French bistro. 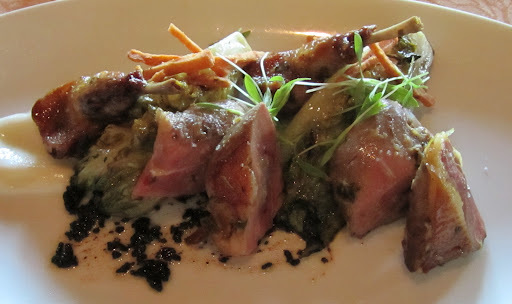 Not only is the food superb, but the couple who own it are professionals who know how to be personable. This place only opened 4 months ago, but from my experience tonight, they will be here for as long as they wish to be. This is truly a place for a friendly feast, and BYOB with no corkage means you can enjoy your meal with your favorite wine. 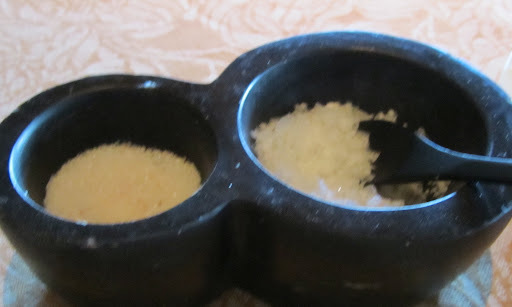 They offer nice rustic bread, butter and olives on the table. I started with a charred romaine salad with crispy pancetta, blue cheese, pomegranate seeds and roasted bosc pear for $8 that could have been a meal in and of itself. 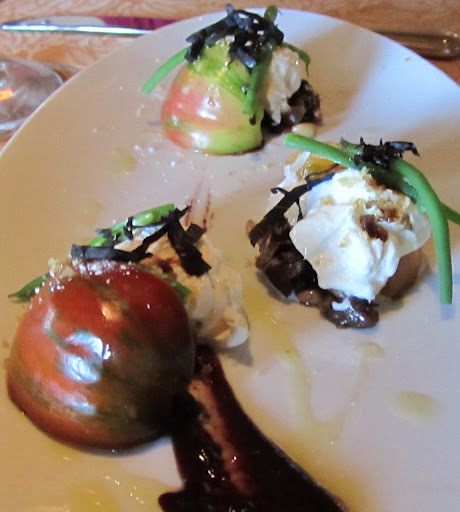 Great combination of flavors and lovely presentation. I chose the Boeuf Bourguignon for $18 which came with wild mushrooms, paparadelle, pearl onions, turkey bacon and carrots that was so perfectly done, I don’t think I will ever go to the trouble of making it myself again. The portion was so generous that I ended up taking half of it home. 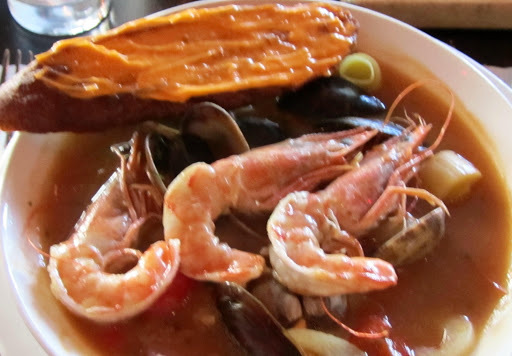 I tried the Bouillabaise another night and it invoked memories of Nice with fragrant fennel, leeks and grape tomatoes in a light seafood broth. The fish and seafood were cooked perfectly and I highly recommend this dish to anyone who wants something filling yet light. For dessert my eyes immediately went to the Tahitian Vanilla crème brûlée which was absolutely perfect with the lightly burnt sugar topping and the creamy vanilla custard. 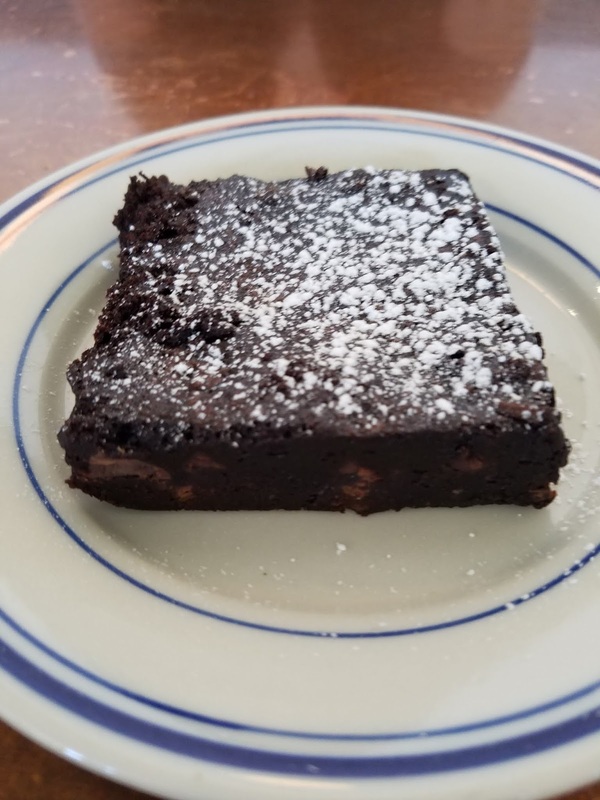 Even though I was full, I still wanted to taste a chocolate dessert, so Babette (one of the owners) suggested the 3 chocolate terrine since it would pack to go nicely if I couldn’t finish it (I took half of it home). The other owner is the chef, Christian, who came out and greeted every diner, making sure everything tasted as good as it looked. After having brunch at Bottega Louie, my friend Marian and I went to look inside Coco Laurent across the street. They were going to open the next day and didn’t even have menus or business cards yet, but the indoor/outdoor space was beautiful and the host said they had imported a chef from France, so of course we made plans to come back once they opened. After giving them a week to let the dust settle a bit, I ventured in for lunch today since my favorite French restaurant downtown, Church & State, had already stopped lunch service by 2:30pm. Coco Laurent serves all day, so it seemed to be perfect timing. The complimentary filtered water had lemon in it, and as with any good French restaurant, they offered a decent sourdough with excellent butter. 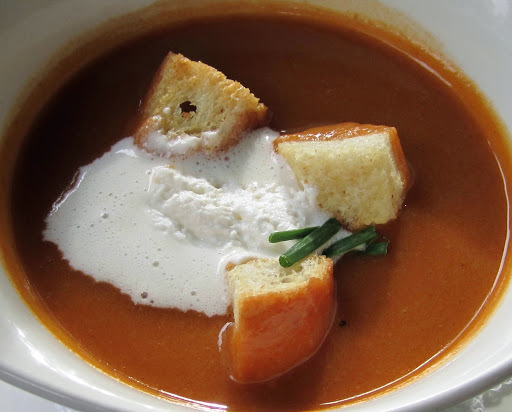 It was a cold (for Los Angeles) afternoon, so I started with the Soupe de Poissons, a fish bisque soup with tomatoes, saffron, aromatic vegetables, croutons, and sour cream for $9. The saffron tomato base made this a nicely rich soup, and the flavor of fish was present without being overwhelming. I would have liked it to have been more aromatic and complex, but I think this was conceived to be more middle of the road for those who might not appreciate stronger flavors. 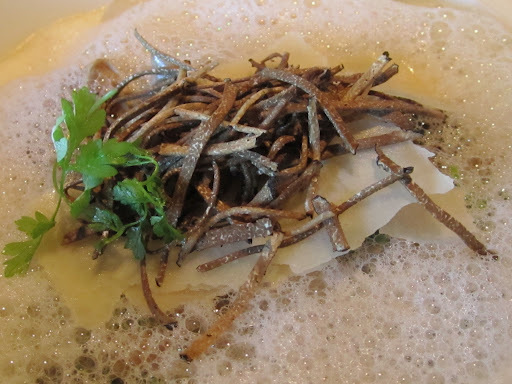 Tant pis for me, but I’m sure most would like this soup (I did like it, but I just didn’t love it). My wonderful server Justin, as well as the manager Pascale, stopped by to see how I liked the soup. I appreciated the attention to customers from the staff very much. The busboy even picked up a button that fell off my raincoat for me and set it on the table! 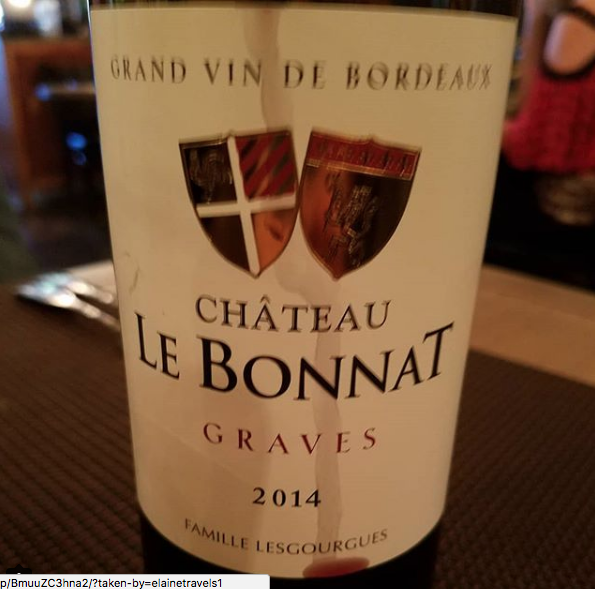 The wine list is quite varied and reasonably priced with a glass of St. Emilion for $15 or a Malbec for $9, for drinkers of white, they have a a nice Chardonnay from Sonoma Cutrer for $10. I couldn’t wait to try my steak tartare, made with extra lean Angus ground beef, cocktail sauce, onions, capers, cornichons, capers, chopped parsley and topped with a quail egg, served with smoked rosemary waffle potato chips for $14. Like the Soupe de Poissons, I found this good, but not great. The quality of the beef was wonderful, but the flavor was a bit bland. 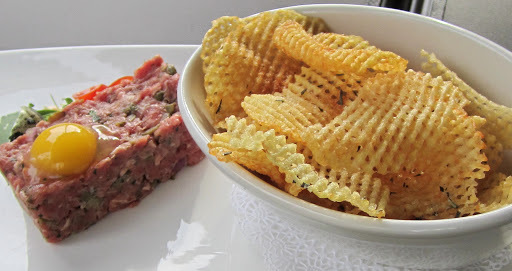 I loved the rosemary waffle potato chips and although they were fragile, topping them with the beef tartare added a nice texture and seasoning to the beef. I mixed in the micro cilantro greens, but I found that they detracted a bit from the tartare, so I would recommend not incorporating them into the beef. 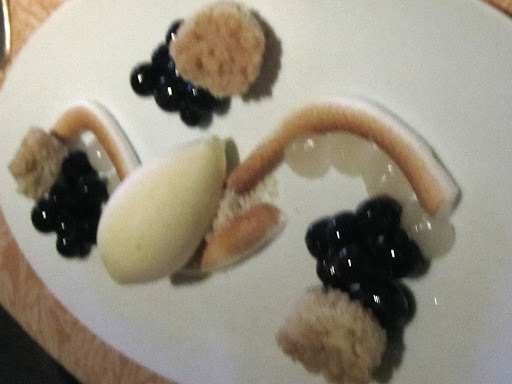 The desserts looked lovely, but with aggressive Los Angeles parking enforcement, I risked being towed if I lingered. Coco Laurent would be worth another visit, perhaps after a few more weeks as the kitchen and executive chef improves to equal the service in the front of the house. If the wait at Bottega Louie is over 30 minutes, which it often is, this place will surely get some of the overflow, but they won’t keep it unless they add more flavor to their French menu. I am not one of those who try a place immediately after it opens or when it is red hot. Staying power and consistency after the initial passion count in both romance and restaurants. 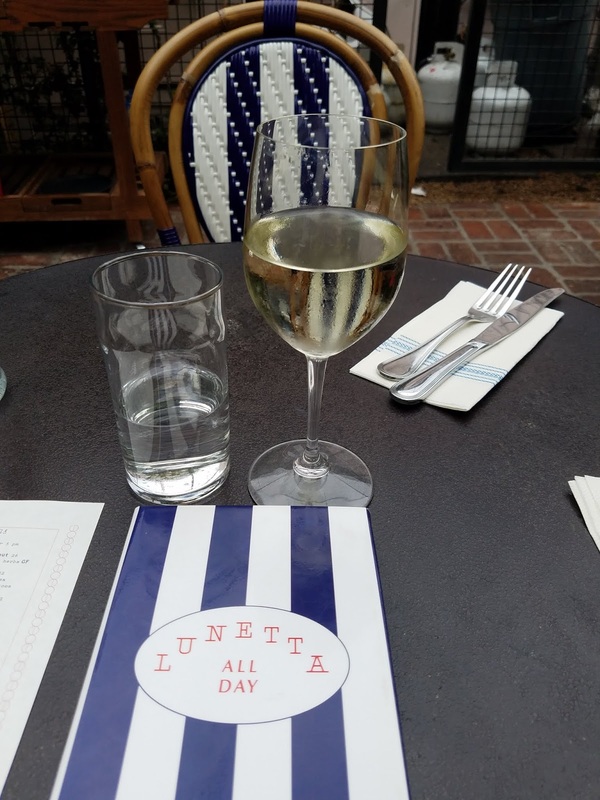 That is why I love places like Il Grano (which just celebrated 15 years of business) and why I waited a year to try Bottega Louie. Church and State has been on my “go to” list for some time, and I finally made the trek to the literally Industrial street of downtown Los Angeles. 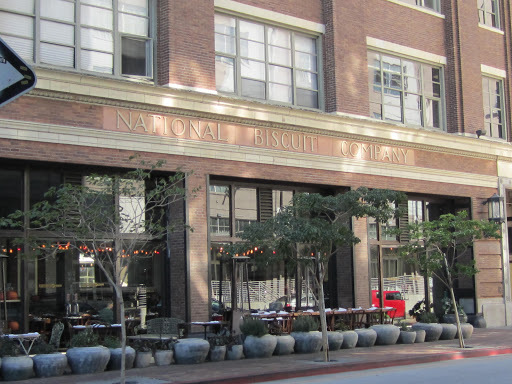 The restaurant is in the former Nabisco factory building, and the area reminds me of New York City’s meat packing district, but the food is decidedly and wonderfully French bistro. 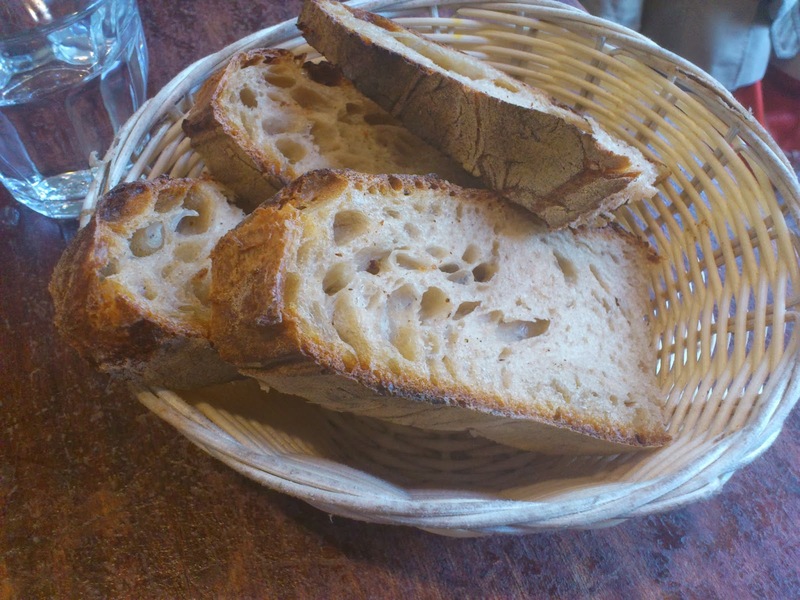 A hallmark of a great French restaurant is the bread they serve. 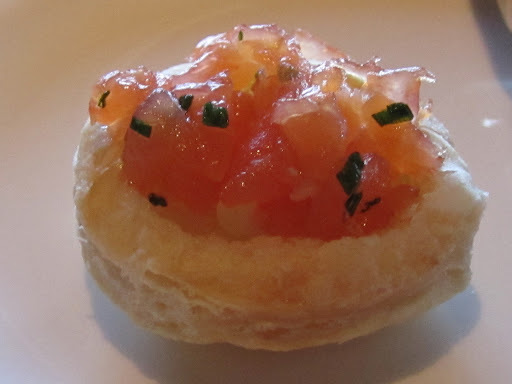 Any place that serves mediocre bread (or worse, no bread) automatically becomes a suspect in my book of “Faux French restaurant”. 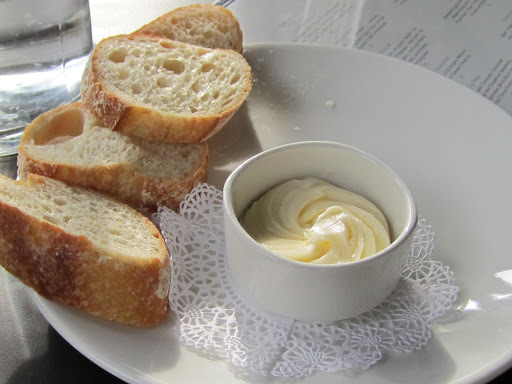 Not only is the bread here marvelous, but the butter is so good that when one of my dining partners spilled some on the table, she scooped it up to get every bite of it! 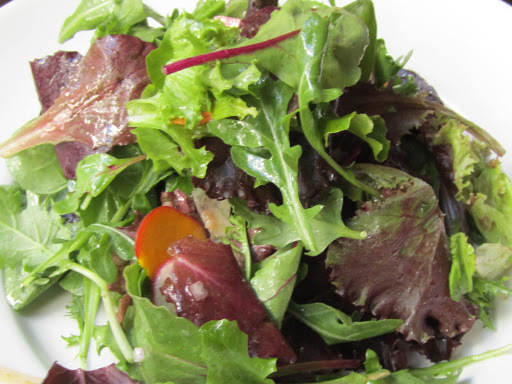 The Salade de Mesculn had heirloom radishes and fennel in it and the dressing was a superb vinaigrette. 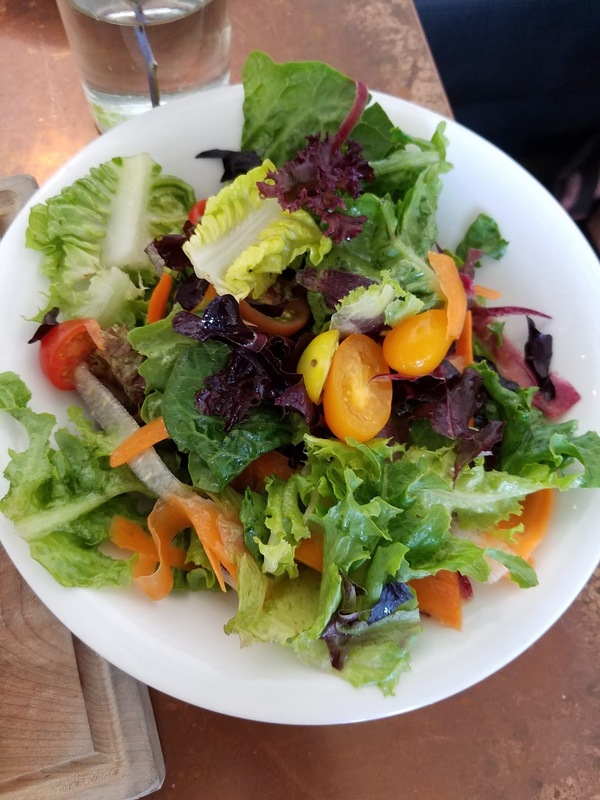 The waitress said they grow their own greens, so this plate is quite literally freshly picked for the meal! 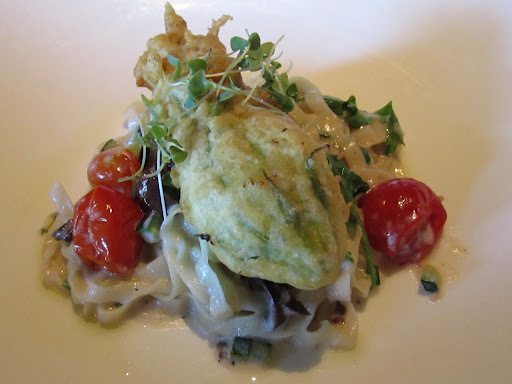 If you order their daily $19 lunch Prix Fixe, this can be one of the three courses, otherwise it is $8. 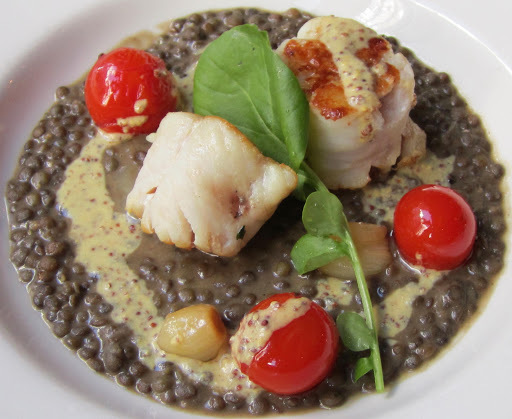 The Ling Cod on a bed of lentils with roasted tomatoes, pearl onions, and a wonderful mustard sauce is now one of my favorite fish dishes in any restaurant in Los Angeles! 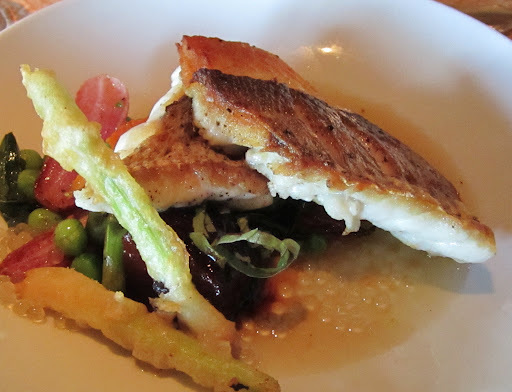 For $24, this main course is both light and filling enough to convert non fish eaters. 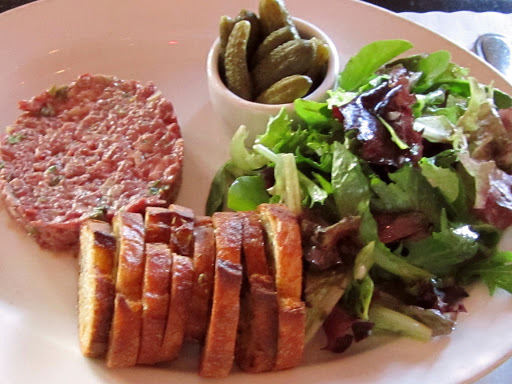 Steak Tartare is listed as an appetizer, but for $14, this is a very nice lunch with a side of greens and fries. The hand cut New York strip loin tartare was one of the best I’ve tasted in over a year, and the portion is big enough to share if you are not eating this as your main meal. 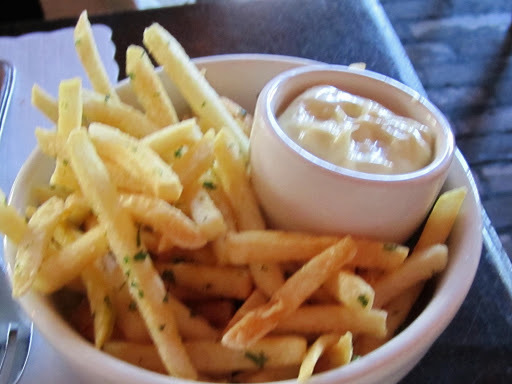 The fries were delicate and crisp, served with a side of fresh mayonnaise. 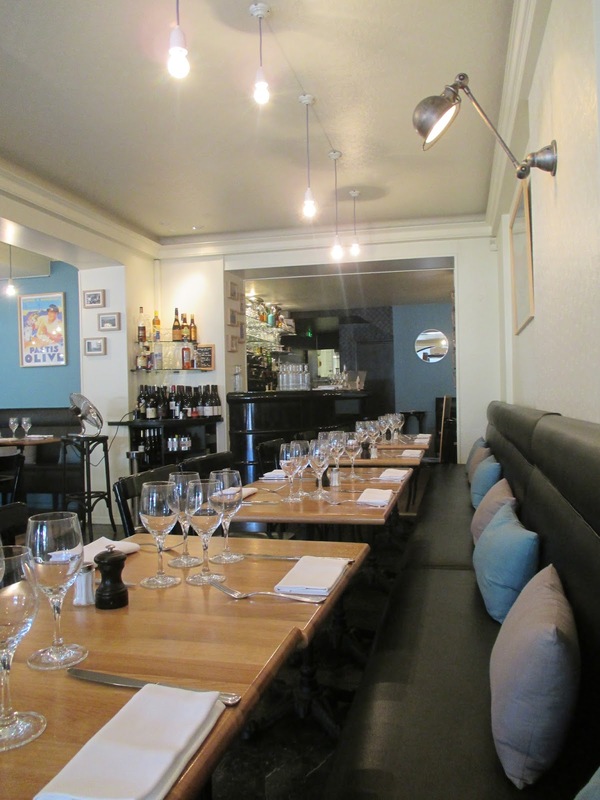 I saw two nearby tables with the Bouillabaisse, a provençal fish stew made with blue prawns, manilla clams, p.e.i. mussels, fennel, tomato, potato, leek and could not resist. They offer two sizes and I went for the larger one, priced at $24. It was perfumed with saffron, and the soup was “comme il faut” with the rich fish stock, fennel, and leeks blending their essences into a heavenly broth. 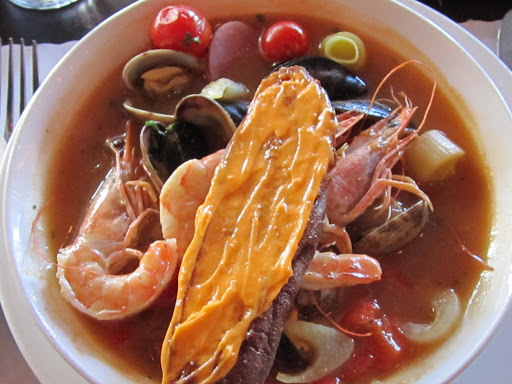 The rouille topped toast and the perfectly cooked seafood reminded me of my favorite Bouillabaisse place in Nice. 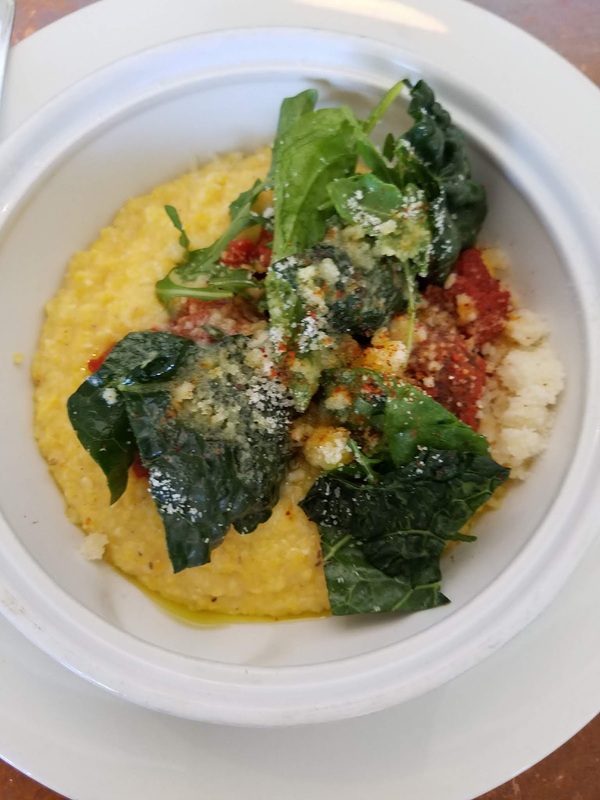 The larger plate is a hearty meal, but somehow I managed to finish every delectable bite of this marvelous soup. The prawns were some of the best blue prawns I’ve ever tasted (and that includes ones I’ve made myself)! Their wine list is exclusively French and very reasonably priced with glasses from $8-$20, so I ordered a nice Rosé from Provence for $12 to go with this seaside Provençal dish. 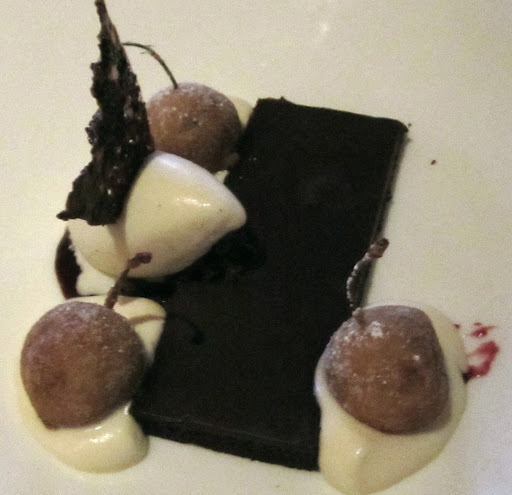 I could not eat dessert, but one of my dining partners could not resist the pot de creme of chocolate and coffee custard, crème chantilly, sablés cannelle cookies for $9. 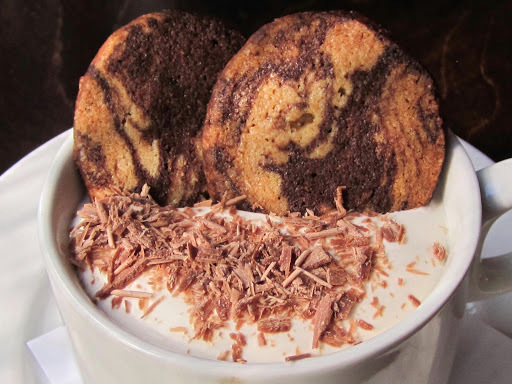 I tried the cookies, which were wonderful, and she loved the creamy pot de creme. 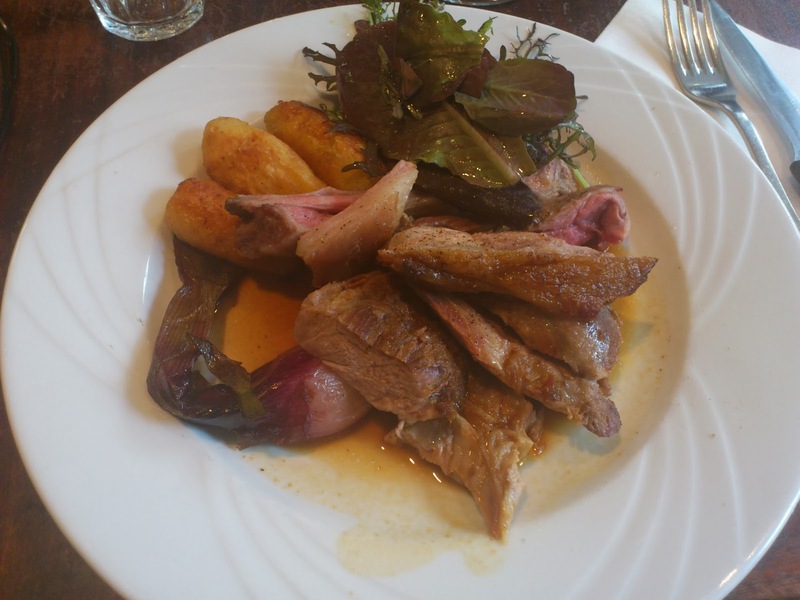 Finding excellent French fare in the heart of an industrial area is like finding a pot of gold buried in your backyard!